Virginia Cooperative Extension will be hosting a “Grow Your Own” vegetable gardening series on March 2, April 13, May 4, June 8, July 6, August 10, September 7, October 5, and November 16 of 2015 at the Prince Edward Extension Conference Room, 100 Dominion Drive, Farmville, VA.
and cooking and food preservation demonstrations. The cost will be $5 per class or $30 for the entire series. For more information and to pre-register by February 27th contact the Prince Edward Extension Office at (434) 392-4246 or cgracem@vt.edu. • Improving food access in underserved communities. 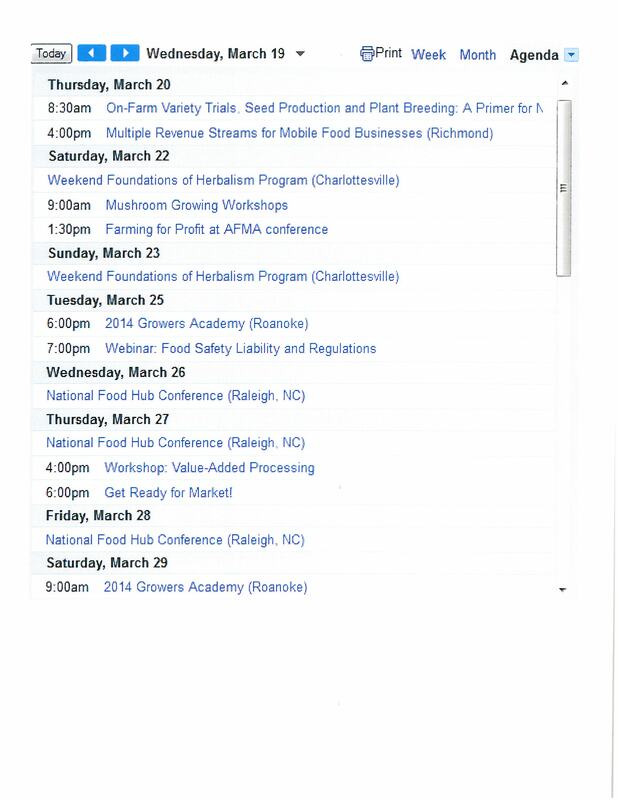 Guidelines, instructions, and the application for the USDA Specialty Crop Competitive Grants are available online at http://www.vdacs.virginia.gov/marketing/scrop.shtml (click on Application Form to apply), via e-mail to Melissa Ball atmelissa.ball@vdacs.virginia.gov, or at VDACS, 102 Governor Street, Richmond, VA 23219. 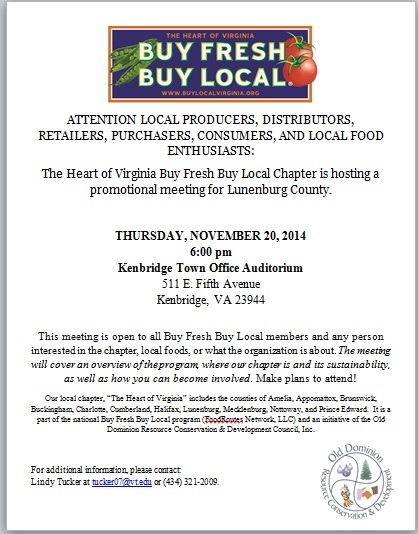 The Heart of Virginia Buy Fresh Buy Local Chapter is hosting a promotional meeting for Lunenburg County. This informational and update meeting will be held at 6:00pm in the Kenbridge Town Building Auditorium this Thursday, November 20, 2014. Please pass this along to anyone you think may be interested! 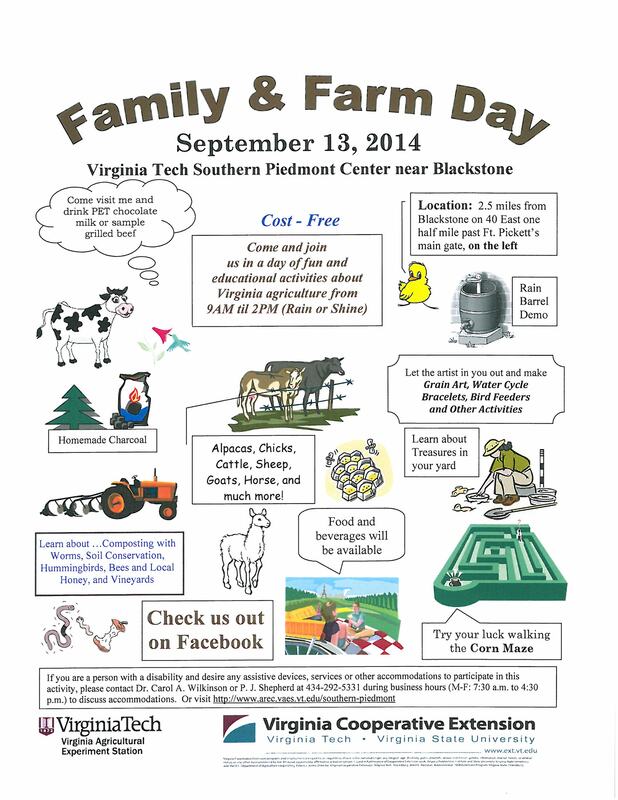 (They do not have to be in Lunenburg, but can be from any of the Heart of Virginia Chapter counties (listed above). If you have questions, please contact Lindy Tucker at tucker07@vt.edu or (434) 321-2009. Thank you! The purpose of this post is not to scare you away from raising your own chickens or away from buying eggs from someone who does, but simply to make you aware of the food safety issues related to food production in general. Commercial agriculture practices do a great job of following strict food safety guidelines, but as more and more people are interested in raising their own food, there is a bit of a disconnect with the food safety concerns of raising your own. As of May 7, 2014, a total of 60 persons infected with the outbreak strains of Salmonella Infantis orSalmonella Newport have been reported from 23 states. Epidemiologic and traceback findings have linked this outbreak of human Salmonella Infantis andSalmonella Newport infections to contact with chicks, ducklings, and other live baby poultry from Mt. Healthy Hatcheries in Ohio.This is the same mail-order hatchery that has been associated with multiple outbreaks of Salmonellainfections linked to live poultry in past years, including in 2012 and 2013. 82% of ill people reported contact with live poultry in the week before their illness began. Findings of multiple traceback investigations of live baby poultry from homes of ill persons have identified Mt. Healthy Hatcheries in Ohio as the source of chicks and ducklings. Always wash your hands thoroughly with soap and water right after touching live poultry or anything in the area where they live and roam. These recommendations are important and apply to all live poultry, regardless of the age of the birds or where they were purchased. This excerpt and the map, were taken from the Center for Disease Control website, posted May 8, 2014.